Did this word start a slideshow of gym, restricted diet and a tyrant trainer? I assume the answer to be 'Yes! ', like it was in my case and for many others as well. What if I replace gym with happiness, restricted diet with laughter and a tyrant trainer with sincerity packed with sheer inspiration! That would summarize to Deepak Shinde and Jashn e Fitness. A couple of weeks ago, I was invited to attend an event at Jashn e Fitness at their Basavanagudi location, Bangalore. Being a 'not much into fitness' person, I assumed the event to be really stereotypical where people would be exercising, crunching themselves with those not so fancy looking gym equipment and then sipping from bottles of protein shake. To my surprise, there was absolutely no such thing happening. On entering the facility, honestly speaking I was awestruck looking at such umpteen attendees seated and grooving themselves to one enchantingly peaceful music played in the background. And there stood a man, casually dressed up in harem pants, a tee and scarf (exactly how you see in the picture). Dynamic, Energetic, Full of vigor, zest and zeal would be the adjectives that best describe this pragmatic personality. 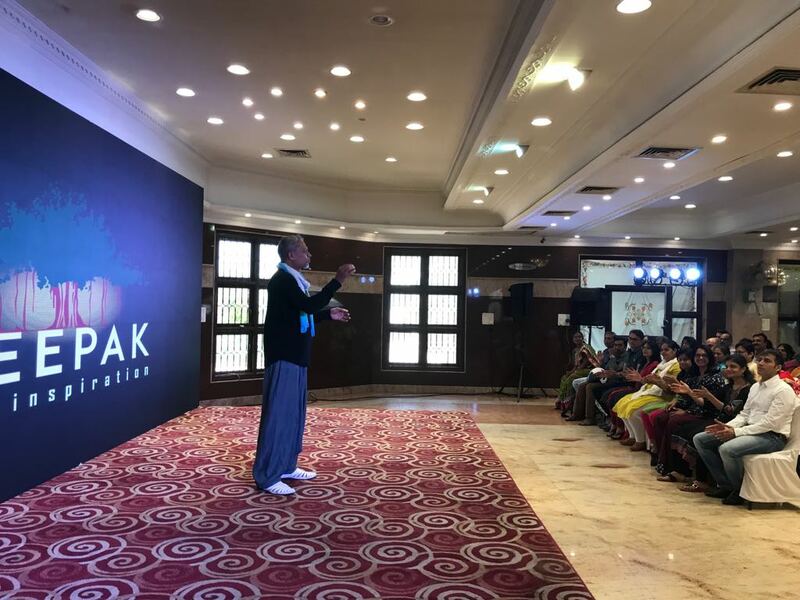 With an experience of over 16 years, he has been inspiring and motivating people of various age groups; as young as 10 years to as old as 60+ years to foster healthy mind, flourishing body and a balanced way of living. Talking from his point of view, stress is something that has to be tackled in its very inception. And to deal with it, a person is supposed to release it out. Let me tell you how Mr. Deepak does that. This means, we as adults are somewhere consciously or unconsciously afraid of being judged and thus hold back ourselves from, let's say venting out our feelings and emotions, or thoughts or inhibitions and so on. And that, indeed results in stress buildup. So to release all the stress, he asks people to be a kid all over again! Laugh like you've heard the best joke, cry like you've been badly hurt and dance like there's no one to watch you. And this really works! He has couple of programs that happen at Jashn e Fitness on a regular basis and the one that grabbed my attention was his BMY (Body Mind and You). On our personal discussions with him, this program was mentioned and I got to know there are people out there, who lost 4 kgs in just 2 days. ARE YOU SURPRISED LIKE I WAS!! I know! So for you to be assured of what you just read, Click Here!